A few days back I was walking through the living room. It was the kind of walk that happens when you are headed for something and want to get there before you forget what it is. I glanced at the mantle and kept walking…stopped and backed up. There in the living room was a delightful clustering of roses. Why? Just because. Just because my husband loves giving them to me and I love receiving them. When we first got together, roses were his “go to” gift for birthdays, anniversaries, and the like. He had a favorite shop in Salem where the florist would hand wire each rose so their little heads never slumped while aging. They were stunning, don’t get me wrong, but so was the price tag. As priorities shifted (along with finances) we came up with a clever idea. Instead of roses, we would go to a nursery on our anniversary and pick out a rose bush. This worked splendidly (until we ran out of rose space). We have reds, pinks, whites, and two-toned roses. 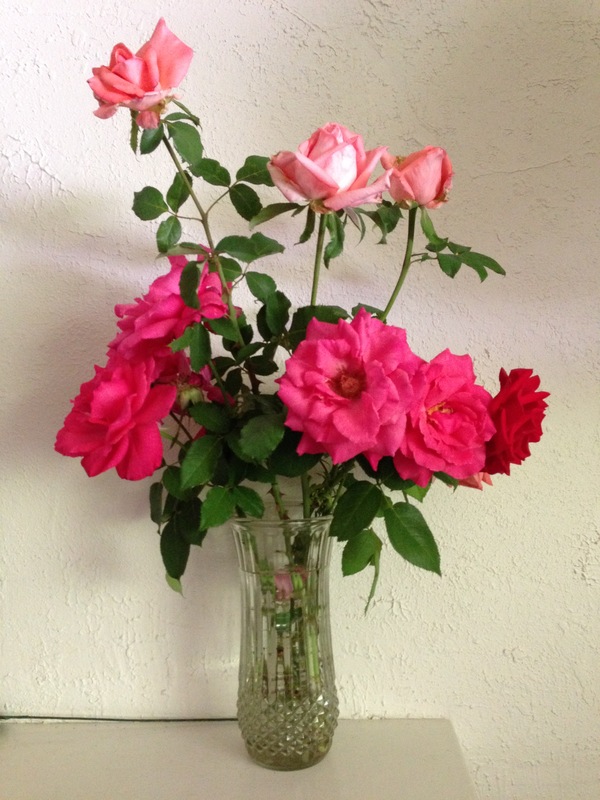 Now, throughout the rose growing season I am surprised by bouquets. Just because. Yes, yes! Hand written notes are a lost art and always a lovely gift, agreed!